How to remove blackheads on the nose is the most common dilemma of anyone with acne prone skin. Among those who suffer from all forms of acne, the most common dilemma we will all face is the nose blackhead. They’re usually small, and they never seem to go away. I will remind you all out there that a blackhead is essentially a clogged pore with a little black head on it. If you ever see little white hair sticking out of the pore, many people think this is also a blackhead of sorts. People will sometimes have what is called a sebaceous filament peek up above the pore. Remember that our skin naturally produces oil? It’s there to ensure our skin doesn’t dry out. The filaments are there to help that process along and distribute the oil onto our skin. On some people you’ll see those sebaceous filaments sticking up on their noses as little white hair like things in their pores. It’s not a clogged pore, but they can be reduced in appearance along with the blackheads that exist on your nose if you follow the proper skincare routines. This method should be something that’s done on a weekly basis; as if it’s done too often it can make your issues worse than they were before. Cleanse the skin, exfoliate away any excess dry skin, steam to open the pores, use a mask to help treat the area, and finally rinse with cool water. Washing your face twice a day really is one of the most important steps for acne prevention, and key to get rid of blackheads on the nose. The first ingredient in the formation of a blackhead is excess oil. After a long nights sleep, you wash off your face in the morning. After a long day you wash your face again. It seems like such a simple thing, but for someone dealing with acne prone skin, it is something that becomes a chore. For a girl especially, you can no longer come home tired and forget to remove your makeup at the end of the night (even if it’s just a quick swipe with a makeup remover wipe). That makeup you use to cover your blemishes now becomes your worse enemy. It may help make your issues worse if you don’t wash off your makeup every night. It is really important to ensure that you wash your face day and night. Now don’t overdo this, because cleaning your skin too much, or with too harsh of a cleanser can actually cause the problem to become worse. Don’t confuse cleansing your skin with treatment. I did that to myself in high school. There is a point at which giving your skin too much treatment can cause it to fight back in defence. Washing it day and night with a gentle cleanser is usually enough. As we learned about the formation of a blackhead, the first ingredient is your skin’s natural oil and the second ingredient is skin debris. Of the best ways to help remove some of those flakes of dry, dead skin hanging around is to exfoliate. It’s not a treatment you want to do more than once or twice a week. Just as with the cleansing step, exfoliating too much can send your skin into self-defence mode. If you do it any more than that and you risk getting rid of not only dead skin cells, but the healthy ones too. This leads to more breakouts, and nobody wants that. There are a number of methods you can use to do this. You can use facial brushes, store bought facial scrubs, or even make your own at home. There are a number of popular recipes to be found, using everything from brown sugar to ground oatmeal. The one I favor at home for my sensitive skin is to mix one tablespoon each ground oatmeal (I grind it in a coffee grinder), brown sugar, raw honey, and jojoba oil. I apply it to a wet face in circular motions for a few minutes, concentrating on my trouble areas. Once that’s done, let it sit for a few minutes, then wash clean with cool water. We mentioned the use of regular steam treatment for deep blackheads, but it’s equally beneficial for the face. Especially when it comes to blackheads on nose removal, this is an important step. The exfoliation clears away the dead skin that has built up in the area. The steam will then melt away the sebum that’s built up in the pores, and clear away and remaining debris that’s left near the follicles. You would rinse the skin with warm water afterwards to help rinse away the debris, but without losing the benefit of the open pores. Research from many sources all say the same thing; you need to apply a mask to help pull impurities from the skin. Many people will just do that after cleansing, which is fine if you’re in a pinch. If you want to get the optimal benefits though, you really need to apply it after you’ve done your steam treatment. Your pores are open and they’ll be at their best when it comes to receiving whatever benefits those deep pores and problems areas are going to receive. The two most common masks for blackhead prone skin will be either a clay mask or a something like a DIY baking soda mask. I happen to keep both powdered clay and baking soda on hand, so I’ve done both. But the easiest to do for most folks is to mix a simple paste of a tablespoon of water with a tablespoon and a half of baking soda. You spread it on your face and let it sit for ten minutes before rinsing it off, at least ideally. I have sensitive skin, so I tend to leave it on for more like 5 minutes. I wouldn’t use it on any areas that are at all dry. Use it only on the parts of your skin that are oily and acne prone. If you really only have problems with your nose, then just apply the mask to your nose. Follow up with a light oil free moisturizer. It seems counter-intuitive, but for acne prone skin it’s really the best thing you could ever do for your skin. That’s it. 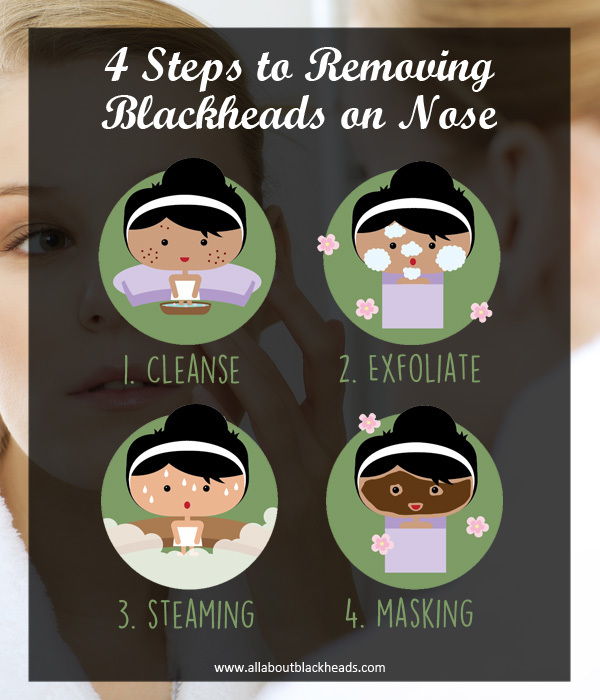 My 4 steps to removing blackheads from my nose. It takes a couple of cycle before you can see the full effect of this method. Make sure you do it consistently or you won’t be able to remove the blackheads effectively. Do share with me your progress if you ever do try out this method. Hi! How many times a week/month I should do those steps? And can I replace jojoba oil with something else?